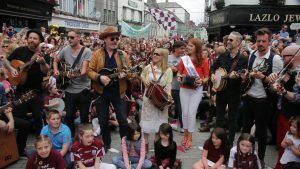 Three years ago, Athenry resident, Kamil Krolak of KamilFilms, brought 15,000 people together for the world’s biggest street performance of “The Galway Girl” in Galway City. The gathered footage from the event was turned into a viral video now watched by over 6 million people around the globe. 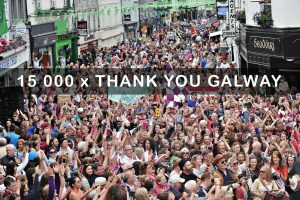 The video keeps promoting the magic of Galway, the spirit of its incredible people, and serve as a great advert for local tourism and hospitality. 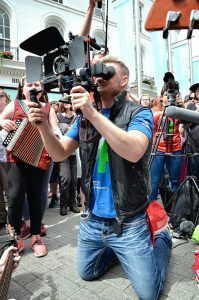 On May 6th 2019, Kamil, his creative partner behind ‘Galway Girl’ – Philip Cribbin – and the talented crew of KamilFilms takes on a challenge to produce something even more spectacular in Athenry. This time on even bigger scale!! 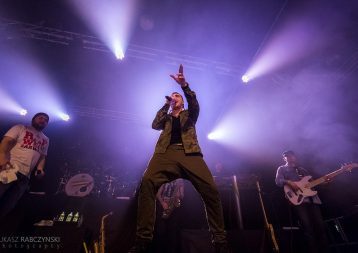 The event will focus on the World’s Biggest Street Performance of the iconic ‘The Fields Of Athenry’ with thousands of people from all over Ireland arriving to Athenry to participate and support. The event will also feature the Official Gunnies World Record attempt to make things even more exciting. The film coverage from the event will be turned into a viral video promoting Athenry, its residents, heritage, tradition, local businesses, entertainment and sense of community. AND WE WOULD LIKE TO INVITE YOU ALL TO BE PART OF IT!! We need your support to make it another global success. 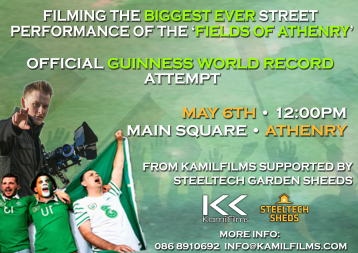 >> OFFICIAL GUINNESS WORLD RECORD ATTEMPT for the largest amount of participants playing the song on tin whistle!! We will have a special section in the crowd divided for the participants of this awesome challenge. Number to beat: 1050. We can do it!! All thanks to the good people and our kind supporters at Steeltech Garden Sheds who are helping make our dream become a reality! We will have bands, celebrities, performers and other groups from around Ireland and World joining us!! The footage recorded on the day will be turned into another viral video promoting Athenry, its people and their incredible tradition. It will represent Athenry, County Galway and Ireland around the globe – just like the “Galway Girl” by KamilFilms has been doing for the past 3 years. So what are you waiting for? To date “The Fields of Athenry” has never been recorded as a community based project – until now! The “Fields of Athenry” is the unofficial anthem of Galway GAA, numerous rugby & soccer teams, including the legendary Celtic FC. Come along, tell your family and friends, bring your instruments, smiles, Galway flags, club jerseys, dancing feet, clapping hands and a lot of positive energy – because that is all we need! 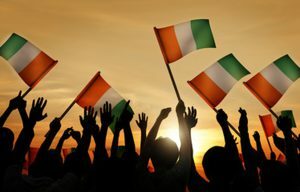 The filming will take place on Monday, May 6th, at 12:00PM, at the Main Square in Athenry, and the recording will take no longer then 40 minutes. The footage will be turned into another unique viral video promoting our incredible Athenry and it’s communities – and it sounds like this one is going to be epic! The producers and creators of the project (Kamil Krolak and Philip Cribbin) will host two Athenry based meeting during which members of local/national businesses, communities, sports clubs, societies and more, will be invited to come along and find out more about the project and how they can support it and contribute to it if they wish. We are open to any support and suggestions. REMEMBER: more support for the project = further it will travel and bigger impact it will have globally. So why not join our efforts? This will be THE BIGGEST opportunity for Athenry to advertise and promote itself in years – and for years to come. Just like ‘Galway Girl’ did – our ‘Fields of Athenry project and video will have incredible impact on Athenry’s tourism, economy, morale and much more! This project will BRING ALL OF US TOGETHER. So be part of it. Help us make it bigger.